So lucky to get to test out the new Giant gravel prototype. It was amazing. The rumble of trains passing through Emporia was punctuated but rolls of thunder. My phone glowed on the nightstand: 3AM. Beneath the clock an orange Accuweather notification flashed on the screen “Emporia Kansas Weather Alert- Severe Thunderstorm watch from 3:30-6:30AM”. A scooter tore back and forth in the street, it’s tinny engine revving and sputtering. I tried to go back to sleep. Impossible. Gradually the lights in the Gufler Mansion flicker on and we all began to descend the stairs to the dining room. 4:30AM. The fifteen of us stared out the window watching the lightning and listening as the thunder grew louder. I tried to eat my oatmeal. The radar showed a huge line of thunderstorms stretching from Wisconsin with the southern tip of the storm ending directly in Emporia. We silently prepped our bikes in the garage as the wind began to twist the trees outside. The temperature was dropping quickly. Pedaling in the darkness to starting line, flashes of purple electricity illuminated the street. Ten of us were riding the full course and we had three handling support. What were we doing here? A 206 mile race is hard enough, let alone starting it in a thunderstorm. I was glad I wasn’t alone. We began to line up outside the theatre in downtown Emporia. After a sweltering day Friday, Saturday felt strangely cold. Goosebump cold. That was positive. At 5:45 the race director announced there would be a thirty-minute delay to allow the storm to pass. Now we were lined up with forty-five minutes to kill. No one wanted to give up their starting spot, and as the wind picked up and drops of rain began to fall we stood stoically with our bikes. The drops grew larger by the second. The wind blew harder. Enough was enough. We abandoned our bikes where they stood and ran for cover under the awnings of Commercial Street. Enough was enough. Would I finally get to see a tornado? The storm ended and quickly as it began. No tornado. The clouds parted as the sun began to rise. How much rain did the course get? Was it enough to settle the dust? Would we all get stuck in the sticky dirt? There were horror stories from previous years of muddy starts; derailleurs ripped from frames as mud and flint will freeze jockey wheels and cause catastrophic failure. Months of preparation and training can go out the window 200 miles short of the finish line. It’s all part of the gravel gamble and the mystique of Dirty Kanza. Six-thirty arrived and we glided out on the wet pavement. When we turned out of town and on to the gravel the dirt was perfectly tacky and fast. However, each subsequent turn offered a different road composition and soon dirt bullets were shooting off treads, peppering riders with bits of rock and clay. To my right a rider bled from a large gash under his eye. “What happened?” “Took a huge rock to the face” he said nonchalantly. “You’re really bleeding” I stated obviously. “Yeah, I know” He was unfazed. We pedaled on. We weren’t even ten miles in. Large branch limbs littered the road from the storm, completely invisible to the peloton. Someone tried to call it out but it was to late. Explosions of wood and bark sent sticks into spokes and twisted derailleur hangers. Riders started to go down. We pedaled on. On gravel there are several different line choices; you can stick in one of the three smooth, tire packed sections of road and suffer the accordion effect of three separate pace lines, or you can take a risk and try to work your way up in the loose gravel on the outside. Hissing tires and sprays of sealant signaled those who were getting overly confident in their passing strategy. By the time we started to hit the rolling flint hills the field had begun to separate. Loose climbs and steep descents were made more difficult by the inability to see more than one foot in front your your wheel. I opted to hang back a little and keep my eye on the terrain. It was also the first chance I had to pop my head up and look around. The sun was rising over the emerald fields as a pack of horses ran next to us trying to keep pace. It was magical. I turned around to watch the line of riders that now stretched more than a mile behind. The pace was fast. Too fast. I had no business riding like this was a fifty, or even one-hundred mile race. But, it’s easy to get caught up in the excitement when your legs feel good. At mile twenty we crossed a shallow rocky creek and a few seconds later I felt the unmistakable squirm of the rear wheel. “Flat!” I shouted and I raised my hand and pulled the side mimicking the dozens of other doomed riders I’d already witnessed that morning. It was a sidewall puncture, an inconvenience so common that five of the seven riders in our group had suffered one on on their pre-ride a few days earlier. These were full protection, very strong gravel tires that I’d never flatted in all my time riding in Southern California. I quickly grabbed a Dynaplug and shoved the tip in the hole, shot the tire up with C02, shook the sealant around, and was back on the road a few minutes later. I pushed hard trying to make up for lost time. A huge mistake. Five miles later the rear tire began to squirm again. The plug had fallen out. After several more attempts and several mangled plugs I was out of C02 and began to hand pump. Another sprint. Another soft tire. Another stop. A friend rode by. “You need anything?” “C02 would be amazing!” I answered. He stopped and tossed one in my hands. Back on solid rubber I leapfrogged groups of riders, burning matches I couldn’t afford to burn at mile thirty. I fell back in a rhythm shortly before the first aid station at mile fifty-five. The tire was going soft again but I limped to our mechanic and he topped it up with a floor pump. I grabbed my Camelback with spare tubes and C02 and was back on course. The hills now begin in earnest after the first aid station. We slogged up and down rollers as I worked with a group of fellow flat victims. No one was afraid to pull at the front. At mile sixty we came upon another rider changing his third flat of the day “this is stupid!” He yelled. “These bikes just aren’t made for this kind of riding” We’re on gravel bikes…on the gravel. Made sense to me. My bike felt amazing. More flint, more climbs, more loose descents. Several other riders in our group flatted out or were dropped. We hung around six strong. By the time we rolled into aid station two at mile 100 it was getting hard to hold wheels as my energy and enthusiasm dwindled. We passed Jens Voigt who was casually spinning along looking amused. “Having fun?” “Ya, this is great!” Ever the optimist. The clock read 5 hours and 44 minutes. After a quick stop it was back out on the gravel. The wind was beginning to pick up. I left the aid station by myself instead of clinging to a wheel. Big mistake. Ten miles ticked by slowly. The cramps set in. Debilitating cramps. Eighty miles left. My pace slowed and turning the pedals became more and more difficult. One Charley horse after another shot through my hamstrings. I kept counting the miles until the next aid station where I was planning to gorge on PB&J and pickle juice. Mentally I was in survival mode now; it was no longer a race. I began to chat with the other riders who pulled along side and then disappeared as I tried and failed to hold their wheel. There was commiserating. I came across Jake Wells, last year’s runner up, he was a shell of his former self. “That start was crazy. I tried to hang on and I blew up.” He gasped. Another rider was pulled off on the side, laying in the grass and stretching his legs “Hey, don’t you race BT Epic in Missouri?” He asked. “Yeah!” I responded. “I’m done. That start was so fast. Last year I was fifth. I’m cracked. I’ll be lucky to finish” he sputtered. The feeling was mutual. I no longer felt alone. Every turn brought a headwind. Every climb provided views of endless stretches of gravel roads. I tried to look for the beauty. A few knee deep creek crossings brought respite from the heat. Occasionally a thick grove of trees provided shade. It was beautiful. Eventually I limped into the third aid station. I’d just completed the last fifty-five miles in slightly less time than it took me to do the first one hundred and five. Do the math. Forty-five miles to go. When I got to our tent the crew went to work lubing the chain, filling my Camelback and changing bottles. They were amazing and so upbeat. I tried to eat as much as I could without getting sick. Two other members of our group were also sitting down, glassy eyed and demoralized. “We went out too hard” they said almost in unison. We made an agreement to get each other to the finish line. We’d work together and we’d make it. It was the most optimistic I’d felt in hours. Eventually we got to our feet, threw our legs over our bikes and pedaled back into the wind. It was agony. The speed hovered between ten and twelve miles an hour as we struggled to make ourselves invisible to the gusts. We’d rotate, trying to take turns as one of us would get a burst of strength while the other struggled. I could barley hold on. Miles and hours ticked by. The sun was beginning to turn a deep gold on the horizon. “Just finish” I kept repeating. Then, I began to pay attention so something outside of myself. The last twenty miles were dotted with local spectators and I began to understand what this event was about. Entire families sat out on lawn chairs cheering on every passing rider. It was a beautiful summer evening in the prairie. They’d been there for hours and would be there well into the night. Some had coolers and were handing out bottles of water. Others rang cowbells. It didn’t matter if you were first, 10th, 100th, or 1000th. Finishing this race was all anybody cared about and the town was there to make sure you accomplished that, and they were determined to provide you with all the encouragement they could muster. My grimace almost turned into a smile. I was suffering, but I began to think about the riders who would be out there on course for over seven more hours. What were they going through? What kept them turning the pedals for over twenty hours that day? They deserved the most credit. As we began rolling back into town the sun shone through the trees, it was blindingly bright and with the thick, dried mud plastered across my glasses I was nearly blind. We crossed bridges and railroad tracks, then suddenly found ourselves winding through the Emporia State University campus and into the finishing chute on Commercial Street. The road was lined with thousands of people, all cheering, ringing cowbells, and offering high fives to every rider as they churned toward the finish line. Typically, once the leaders finish a race the crowd disbands and it’s a solemn affair as the losers make their way to an empty finish area for a ribbon or a hug from their spouse. There might be one spectator or a race organizer offering a pat on the back. Not at Dirty Kanza. For a delirious minute I thought I was on the Las Vegas Strip. Spotlights illuminated the dusk, music blasted, lights flashed, and every person I stumbled past shook my hand, asked what they could get for me, patted my back and offered a genuine “congratulations.” For another delirious minute I felt like I won, and in a way I did. There are no losers in a gravel race, that’s the whole point. It’s a physical and mental test, a state of mind, an event designed to challenge riders as well as the whole notion of racing. It’s not about a podium shot or an age group victory. I sincerely hope it stays that way. It’s about working together as riders and as a community to remind each other why we started riding bikes together in the first place, and why we continue to love this amazing sport. As we left downtown Emporia shortly after midnight, a steady stream of riders passed through the finishing shoot. Every rider got the same hugs, high fives, and heartfelt congratulations that the leaders had experienced eight hours prior. Riders would continue to come in for over three more hours and the crowd wouldn’t diminish until the last rider crossed the line. Dear Emporia: Thank you for humbling me and reminding me why I love gravel. See you again…eventually. If hindsight is 20/20, I’ve been a bit farsighted lately. I’ve had the Dirty Kanza glasses on for about six months and while June second is quickly approaching, the Belgian Waffle Ride has come and gone in a blur of dust and sweat. I’ve been answering so many questions about DK lately; “What bike are you running?” “How are you training?” “What tires are you going to use?” “1x or 2x?” That I pretty much forgot about the April fifteenth death march in Northern San Diego County masquerading as a cycling event. It was the 133 mile gorilla in the room that I couldn’t see because I was focused on the center of the country. The Belgian Waffle Ride bills itself as the most unique cycling event for a reason; with close to one hundred miles of pavement and a dozen CHP escorts it’s reminiscent of a one day classic road race, yet the rock gardens and singletrack lend an element of a cross-country mountain bike race, and when then you find yourself fighting through ankle deep sandpits and conga lines of rider traffic you wouldn’t be mistaken for thinking that you’re in the middle of a cyclocross race. Then, when you find yourself alone in the wind near Julian with eighty miles left to the finish line you would swear you’re taking part in a lonely sadistic time trail as you fight to stay on the road while toy haulers and RVs blatantly ignore the three-foot law. Sunrise came quickly as we lined up outside the Lost Abbey Brewery in San Marcos. Too quickly apparently, because the start was pushed back from seven to seven-thirty due to a waffle shortage crisis. The Belgian Waffle Ride can’t start without waffles. That’s a rule. After a brief delay we were lined up spinning on the ten-mile neutral rollout. It was anything but neutral. The course changes every year, however, many of the same trails are utilized, and this year the first dirt section came at mile ten. Tensions were high. When there are over two hundred and fifty riders in the first wave, any hope of making it into the leader’s group depends on your placement into the first narrow singletrack. One person unclipping ahead of you can mean minutes of delays. I got lucky and was sandwiched in between Ted King and Neil Shirley in about fifteenth position. It was ideal. Burst after burst we charged up and down the trail, snaking in between rocks and skidding over schist. The occasional blast of rushing air indicating that somewhere, someone had flatted. A brief look down. My tires were full. More rocks, more sand, squealing rotors. The Maxxis Re-fuse 32mm tires turned out to be the perfect choice paired with the 44×11-42 drivetrain on the TCX Advanced Pro1, and I felt right at home in the dirt and on the asphalt. We popped back on the pavement and the pace quickened, then slowed. I was thankful as my heart rate was significantly higher than it should be with one hundred and twenty miles left to race…and my power was significantly lower. An ominous sign. Another group hitched on to us and twenty-five strong we rolled up and around Northern San Diego Country and through Ramona as the pace stayed casual. We were biding our time until Black Canyon. Black Canyon is where the fireworks happen. It’s a six mile, fifteen-hundred foot dirt road climb that dips, undulates and constantly fools you into thinking you’re near the top. There’s an aid station at the bottom and I hit it toward the back of our group, which meant a short wait followed by a painful chase back to the leaders. By the time I caught back on they were slipping away again and I was beginning to drift into a dark place. The body wasn’t responding, the heart rate was high, and there was the brief sense of impending doom. I hung with Jake Wells, Neil Shirley, Adam Mills, and Spencer Powlison as we cranked our way up the climb, watching the leaders disappear off the front. I was feeling pretty shattered by the time we reached the aid station at the top. We lined up and pushed hard on the road section but I kept drifting off the back and yo-yo-ing until the elastic snapped. It was the kiss of death. Struggling and alone in a strong headwind I was glad I opted for the Pursuit helmet, but at six-and-a-half feet tall there’s no amount of aero equipment will ever save me. The mind starts to wander to dark places as you watch the riders ahead disappear over the horizon. Then you look down at your computer: 70 miles. You start to do the math. It’s just over the halfway point. There are three or four hours left. Maybe five hours at this rate? There’s nothing in the tank. Podium chances have vanished. Life choices are questioned. Finishing seems impossible. “If I just stop here and lay down in the grass will anyone find me?” Pedaling becomes a survival instinct as you churn the windmills to keep the bike moving forward. Over the next three hours second, third and fourth winds come and go. Motivational speeches stream through your head. Songs are shouted silently. You try to eat and drink. Waves of nausea and hunger radiate simultaneously through your gut. And then the cramps set in. Mine usually start in the hamstrings, on the inside of my leg just above the knee. Subtle at first they grow more debilitating. I gobbled and handful of salt tabs, chewed them, bit my tongue, anything to take my brain off of my legs. Next come the calves. Painful spasms you can watch from the saddle as the back of your leg takes on a mind of its own, convulsing and twitching like a snake under your skin. Finally the quads go, jumping muscles pulse under the bibs. Stretching on the bike holds them off for a bit but soon they return. More fierce and persistent. Sharp and debilitating. Navigating rock gardens becomes instinctual as an autopilot mode takes over. Miles ticked by. Hours passed. Suddenly, the base of double peak loomed. It’s only about one mile long and five hundred vertical feet but at mile 125 it’s gut punch when you need it least. Turning over the pedals takes every ounce of strength as you chug up the grade, knowing a descent and the finish are just on the other side. There are people cheering but with tunnel vision it’s hard to notice them. “Finish this, finish this!” Your brain screams. Finally there is the water tower and the dirt descent back to San Marcos. Every turn, dip, and rock is an obstacle trying to keep you from the line. “You can do it.” Suddenly you’re off the dirt and flying back to Los Abbey. The finish line appears. It’s over. Crusted salt falls from your kit like drywall dust. The brain struggles to form a cohesive thought. Everyone is trying to hand you a Coke or a towel, or a beer. Delirium. They mean well but all you want to do is curl up right there and sleep for several days. Well, maybe a shower first would be nice, and those fries look pretty good. How many weeks until Dirty Kanza? Once again I made the trek to Missouri for the always enjoyable BT Epic. Chris Hon picked me up Thursday night and we spent Friday morning on the local single track near his house, which is a hoot. One thing that always impresses me is the amount of trail work Missouri mountain bikers undertake. Every year I come out there’s miles of new singletrack. Chris explained that the trail creation process is as simple as flagging a route, consulting with the parks and making sure the planned trail doesn’t intersect any ancient Native American burial grounds, and then finding volunteers to help with trail nights. It’s amazing the community and organization they get into the woods on Thursday nights and Saturday mornings. We were lucky to hit a new trail right as they were taking the caution tape down. We hooted and hollered as we shot through the rock gaps on fresh dirt. “You’re the second and third riders ever come down this!” the trail workers yelled as they pulled up the flags. “The first just came through a few minutes ago.” And thus a trail is born. We hit the road and made our way down to Bass River Resort, however knowing my fascination with caves Chris had scheduled a stop at Merimac Caverns on the way. We shuffled into the gift shop and got our tickets for the eighty minute tour. While I’m a fan of a keeping nature natural I tried to appreciate the multi colored lights and “God Bless America” slideshow on the stalactites. I suppose they have to make people feel like they’re getting their money’s worth. The cave system is impressive with over twenty-five miles of underground labyrinth, some of it still unexplored. The tour hardly scratches the surface, sending visitors only a half-a-mile in but it’s enough to get a feel for the grandeur. Back onto the road and into Bass River. I felt a little pressure to win this year with a close second place finish the year before and a huge improvement over 11th place in 2015. I brought out my own bike this year and had opted for the 27.5” Anthem. But what tires? I pulled off the Rocket Rons and threw on the 2.35” Nobby Nics. Berryman/Ozark Trail is chunky, damp, loose, and usually covered in wet leaves. I needed all the help I could get. The morning of the race was worm. Almost hot. At sixty-five degrees it was about thirty degrees above the previous years starts. I went out hard. There’s a cash prime for being the first rider into the woods, which means you have to hammer four miles of a gravel road climb with a frothing peloton of 500 riders chasing. It also means you have the trail to yourself when you get there. I broke again this year. It worked. A train of four riders latched on to my wheel and chased. But, this being a race of awesome midwest MTB dudes and not agro LA roadies, no-one tried to pick me at the finish, although they should have. “You deserved it dude, you put down a huge effort” was the response I got after thanking a chaser. Wow. I love this place. This is what riding should be. Once we entered the woods things got strung out. Aaron and I were off the front. Way off the front. By the time we hit checkpoint one at ten miles in we had a two minute lead. It was clear he wasn’t going anywhere. Every move was countered and we rode together through the forest alone until mile 26, when, out of nowhere we were over taken by Bryan Foley who blasted around and disappeared into the foliage ahead. We’d reel him in on the climbs and he would loose us on the descents. And suddenly he was gone. As usual by mile 35 and the long gravel section I was suffering. Aaron who had dropped back to seal a puncture caught back on and chased up the Three Sisters and back into Bass River, where he passed me on the paved climb. I was cross-eyed trying to keep the pace but eventually had to relax and let him slip ahead if I was going to make it seven more miles. The last portion of the BT Epic is the hardest, in my opinion. After rolling past the finish line you still have close to forty five minutes left including the biggest climb of the day. You’re so excited to finish you become convinced the next descent will bring you to the finish, until you find yourself hitting another kicker, a step up, another road crossing, and there it is. The tight turns into the campground. The afterparty is legendary. On Friday evening Chris and I helped unload ten kegs so I know there were at least that many in the beer truck. There’s all you can drink beer, all you can eat BBQ, live music, and, after the awards…a hayride that fits somewhere in-between Burning Man and Deliverance. Sure Kamikaze is rooted in baggy shorts, goggles, and blazing down a mountain at the speed of a comet entering the atmosphere, however, the XC race is one of my favorite all year. The course is awesome and very similar to the USAC XC Nationals course of 2015 and 2016. It’s a little longer but still has the awesome Shotgun descent, which will leave you smiling at the end of each lap. The weather is also always amazing in the mountains in mid-September with chilly mornings and cool evenings. This year the XC race was at 3pm on Friday. I love this race but every year I’m worried they’ll cancel it. The time slot gets worse and worse and for some reason the XC turnout is small, including the Pro field which features a nice payout of a few hundred bucks. I decided I’d be a crazy person and drive up super early Friday morning, race, and then hop in the car and get back to the family. Ambitious indeed. Five o’clock came quickly and I was out the door by 6, which put me on the mountain around noon. Plenty of time for a warmup and to catch up with friends. I’d resigned myself to a second place finish behind Nick Beechan (which shows just how strong my ambition and mental fortitude are) but Nick hurt his knee a few weeks earlier and didn’t show up. For the first time in several years I was thinking I could win this race! With two second place finishes I really wanted to take the top step. I brought up the Anthem 27.5″ for kicks and did not regret the squish. We started quick. Young guns Turner and Tate took off flying. I hung on their wheel the first little climb then passed before the singletrack. I could hear them close behind until we got into the woods then there was a gap, but when we hit the long climb they were right there again 10-15 seconds back. Ouch! I was throttled. Gradually toward the end of the first lap they fell farther back and by the middle of the second lap they were out of sight. I stepped off the gas a little on the last two laps but didn’t want to give away too much time. The altitude was searing the lungs but the Edge was keeping the leg burn down. Push push push. Awards and back in the car for another 6 hours in the car. What a day! I’d do it all over again. After a clean run in 2014 my Leadville races have been marred by flats. In 2015 a torn tire took me out of the race completely and in 2016 I lost a half an hour as I tried to fill one bad tube after another that gracious fellow racers tossed my way. Oh well. That’s part of what makes racing exciting; the unpredictability of it all. 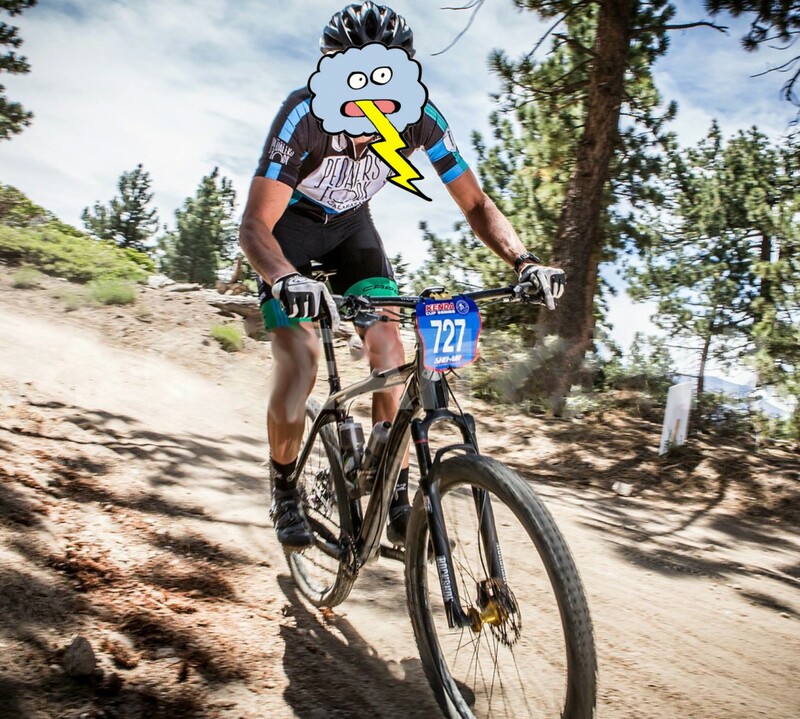 Especially at Leadville- 104 miles offers a lot of pitfalls. This year the LT100 was again the focus of my season. Coach Billy set up a schedule that had me peaking around now even though I’ve done my best to undermine the plan by spending too much time on the bike. But it’s so fun! How can someone want to take a day off? Guilty. I arrived in Leadville Thursday evening, picked up my bike from Cycles of Life in town (thanks to Bike Flights for getting it there cheaply and in one piece). If there’s one thing I hate about traveling for races it’s lugging a bike case around an airport, on shuttles and into compact rental cars… but I digress. After a smooth flight and two hour drive from Denver to Leadville I met up with Dave the crew at Floyd’s and am so grateful for their hospitality. Friday involved building the bike and going for a spin, the typical loop by Turquoise Lake, up Sugarloaf and down Poweline. If there’s one section to check it’s poweline. The lines change a bit every year and it’s helpful to know where the deep ruts are so you don’t end up in them when you’re bar to bar in race madness. We ordered pizza at the house and made it a movie night. The choice? Tour de Pharmacy of course. It was the ideal race distraction and there’s not a more ideal audience to watch it with. Needless to say Lance didn’t get many laughs. Race morning comes quickly. The benefit of the gold corral and close lodging cuts down on the stress.With a 6:30am start it’s early, dark, hovering around freezing, and the last thing you want to do is stand around freezing at the starting line. The atmosphere was the same as always. Thousands of people shivering and looking nervous. The Ergon team was noticeably absent as were the Pro Roadie set as they were racing the Colorado Pro Tour race. The start was mellow. No big initial attacks. Grotts and Wells just hung with the peloton until St Kevin’s climb. The pace wasn’t as hard charging as last year but I knew immediacy my legs were not there. You know that feeling when you know you should be able to accelerate but your body just won’t respond? Uh oh. The heart rate started to redline and I was gasping for air. It didn’t feel as effortless as last year. This was going to be a long day and I was going to have to work. I watched the front ten slip away and fell in with a chase group of eight. We spun our way up Sugarloaf and shot down Poweline and had found ourselves down to about five. We pushed hard on the pavement, pace lining and riding hard until we pulled in the lead group just before Pipeline (minus top 3 or 4 who were way up the road). We worked together until the base of Columbine. One of my favorite sections is riding through the Twin Lakes feed zone. It’s amazing to see Thousands of people out cheering and supporting the riders. If your struggling it’s a great pick me up before the soul crushing Columbine. Every year I think I know how long Columbine lasts and every year it seems longer. You climb for a while on the dirt road in the aspens and it’s serene. I found myself struggling to hold a wheel but there are moments of enjoyment. Once you pop out on the double track above the tree line it’s a whole new form of torture. The pitches are steep, the rocks are softball size and loose and there’s two way traffic. Climbers are struggling to pedal and swerving all over while descenders bomb back down, drifting and sliding all while fighting for a single line. Madness. The descent is fast and jarring and I was glad to be down. My back was hurting and now’s the time when you start contemplating your decisions. Your friends are all at Twin Lakes. With a car. It would be so easy to call it a day. By the time we hit the single track again I was 16th with one rider just up the road and another one slipping off my wheel. Not good. You need a group. I struggled to pipeline by myself in the wind. No one around. I hit the road section. Still not a rider in sight. Last year there were three of us pacelining this section but not this year. It cost about eight minutes and untold watts to get to Powerline alone. People make sure you have someone here. Stop and wait. Anything. Don’t be dumb like me and ride it alone! I was cooked. Poweline never felt so long and steep. I just wanted to be done. And not crash or flat. Cautious. Maybe too cautions. The last twenty miles are always a blur. You fly and skid down Sugarloaf then face the brutal pavement climb back up to St Kevin’s. I alway have trouble here and again lost a few spots as riders spun effortless up and around me. Where did they come from? A mix of emotions occurs. Anger. You try to chase but they’re around the next turn already. Apathy. It will all be over soon. Just look for the red carpet.